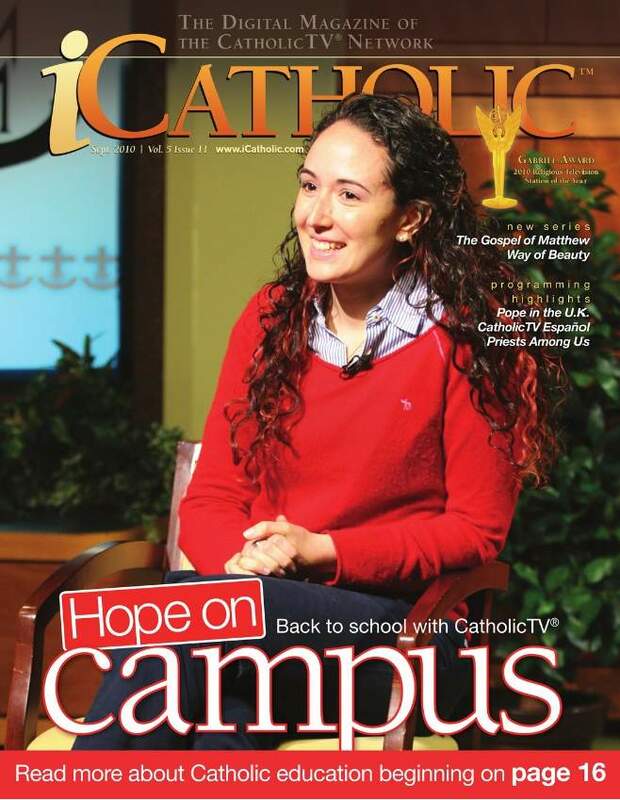 CatholicTV’s free monthly magazine has added 2 new columns. For the month of October, the two new columns focus on the new Roman Missal and evangelization. 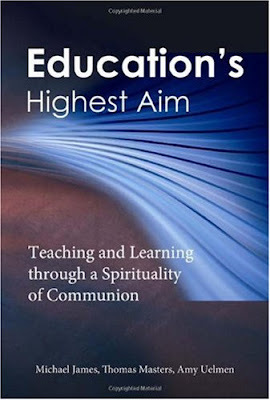 One of the new columns is called Theology 101 and is written by Ms. Rita Thiron, Director of the Office of Worship of the Diocese of Lansing, Michigan. The other new column is written by Fr. Charles Irvin, a priest who worked as an attorney before entering the seminary and who served as a First Lieutenant in the U.S. Army. Known as Fr. Charlie, he is the founding editor of Faith magazine, published by the Diocese of Lansing, Michigan, and worked in young adult ministry for 11 years. In the past, Fr. Charlie has written about a wide range of topics, from suffering, to stem cell research, and natural disasters such as Hurricane Katrina. After 40 years of priestly ministry Father lives in "active retirement" in DeWitt, Michigan, on the grounds of St. Francis Retreat Center and has traveled extensively, including five pilgrimages in Europe and the Holy Land. These two new columns will appear periodically in The CatholicTV Monthly (The Monthly). The monthly is a free magazine produced by CatholicTV. The Monthly typically includes stories and information about CatholicTV, its shows, and subjects of interest to Catholics. The Monthly even includes Catholic crossword puzzles. The September issue of the digital magazine included stories about Oklahoma State University basketball coach Kurt Budke and how his Catholic faith goes with his job. This article was among over a dozen, most of which focused on education, since the school year started in September for most students. Starting in September, CatholicTV launched its new season which includes 3 children’s shows which are new to CatholicTV. 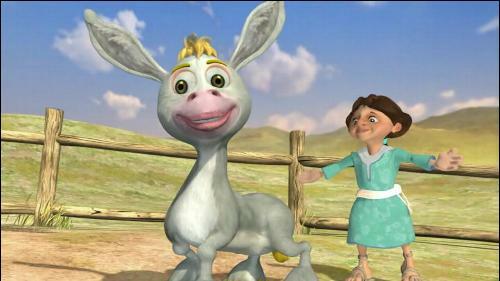 The new shows include 2 animated series, one about a donkey and another about the adventures of a girl named Gigi. These 2 series are called “The Adventures of Donkey Ollie” and “Gigi, God's Little Princess”. Another children’s show new to CatholicTV is “Mr. Henry’s Wild and Wacky Bible Stories” (Bible Stories). Bible Stories uses skits, music, games, and occasional animation to teach children in a fun manner about courage, fear, helping others, respect, and much more. Frank Peretti stars as Mr. Henry. Peretti has sold more than 12 million books in addition to starring in Bible Stories. Air times may vary on a monthly basis. On October 12th, Annie Karto, a singer and writer of the song “You Are a Priest Forever” will appear on the live CatholicTV talk show “This is the Day”. 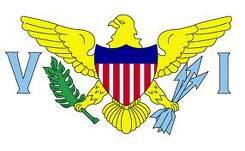 Annie Karto has traveled to over 35 states across the country speaking/singing at many national conferences. Annie is passionate about her Catholic faith, sharing this passion through song and witness on such topics as the healing power of God’s mercy, the Blessed Mother, the Eucharist, Catholics returning home, the sacrament of reconciliation, on being a Catholic woman, and the power of the Holy Spirit. You are a Priest Forever has touched the hearts of many priests throughout the country. Fr. Andrew Apostoli, CFR wrote, "From the first time I heard Annie Karto's song a few years ago, I felt it had a special anointing from the Lord. Even the unfortunate negative publicity against priests that emerged in early 2002 has only made the song that much more a message of hope and consolation for all loyal Catholics who love their Church and their priests! Every priest, in turn, also needs to hear those reassuring words that Annie sings with such joyful enthusiasm and conviction. "You are a Priest Forever!" as the great Cure of Ars, St. John Vianney, patron saint of diocesan priests, reminds us so well, "The priesthood is the joy of the Heart of Jesus!" You will find this song a joy as well!" On October 6th and 7th, CatholicTV will record an episode of its reality-style show “House+Home” with Kristin Bothur and 9 of her 11 children whom she raises as a single mother. Kristin is the author of the book “Eleven On My Own” and also writes a blog of the same name. Kristin and her eleven children recently moved into their new home in Connecticut, which was made possible through the help of a local priest named Fr. Joseph Tito along with many volunteers from the parish, St. Mary of the Immaculate Conception Church, in Sprague, Connecticut. The moving van was donated, and driven, by the Knights of Columbus Council in the area, many member Knights were volunteers on the renovation for the family. CatholicTV suggested that Kristin and her family participate in an episode of House+Home shortly after Kristin told her story on “This is the Day”, a talk show on CatholicTV. The episode of House+Home with Kristin Bothur and her children will air later this year on the CatholicTV Network. Kristin and her children will discuss the new home which they recently moved into as well as their life in a house where 5 boys and 4 girls live with their mother. Kristin’s two young adults are away from home. “House+Home” is a Catholic reality T.V. show taking viewers into Catholic homes and shows how Catholic families live out their faith. 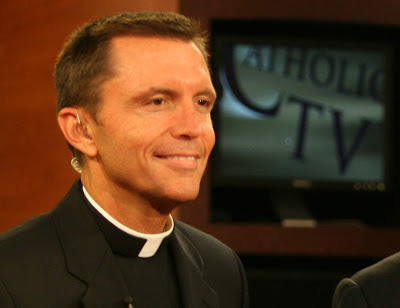 Each episode of “House+Home” is hosted by President of the CatholicTV Network, Fr. Robert Reed. 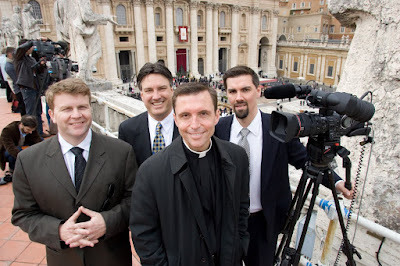 CatholicTV is currently producing a special episode of House+Home in Rome, Italy as well. Move over Facebook, Catholics now have a new reason to hit the “like” button. CatholicTV® Network is proud to announce the launch of a new online social networking community for Catholics at www.iCatholic.com. 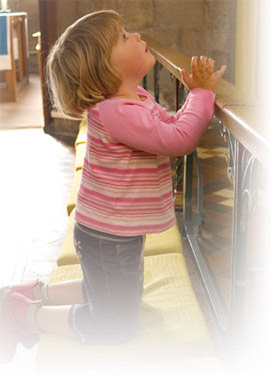 Under the tagline, "I am Catholic, We are the Church,” the iCatholic.com community allows visitors to establish a personal profile, upload images and videos as well as initiate and participate in discussions and forums. The iCatholic.com social community is the first of its kind. Members of this new online community will be able to suggest content for the monthly digital magazine, as well as be part of an exciting television series coming soon to the CatholicTV® Network. The magazine and social community are just the latest in a string of technological innovations CatholicTV has announced this year as it continues its mission of attracting the next generation of U.S. Catholics. As of October 6, CatholicTV will offer its full slate of programs in HD. Earlier this year, CatholicTV added numerous 3D shows to its over-the-air and online lineup, many of which were featured by Stephen Colbert on Comedy Central’s Emmy-Award winning program, The Colbert Report. On October 5th, the Secular Institute of Missionaries of the Kingship of Christ (SIM), a unique secular institute of women will be discussed on the CatholicTV talk show “This is the Day”. SIM members are consecrated to the Lord, and as such do not marry. Unlike the typical religious brother and sister, SIM members do not live in community nor do they have a shared mission/apostolate. Instead, each member of the SIM has her own unique job, while aiming to live out the spirituality of St. Francis of Assisi. Mary Lou Carr, a member of the SIM will discuss SIM and her role during an interview on This is the Day. 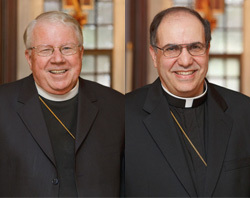 Video of the Episcopal Ordination Mass of the Archdiocese of Boston’s Auxiliary bishops Arthur L. Kennedy, Ph.D., and Bishop Peter J. Uglietto, S.T.D., is now viewable in its entirety at CatholicTV.com. The Mass took place on September 14th, on the Feast of the Exaltation of the Holy Cross at the Cathedral of the Holy Cross in Boston, Massachusetts. Coverage of the Mass includes commentary throughout by the President of the CatholicTV Network, Fr. Robert Reed. Those in attendance included: Cardinal William Henry Keeler (Archbishop Emeritus of Baltimore), many bishops, clergy and religious from across the country and the Archdiocese, Metropolitan Methodios, members of the Ecumenical community, college presidents, and current and former public officials among others. CatholicTV will produce several programs in Rome, Italy during the week of September 20th-25th. CatholicTV invites its viewers and anyone interested to watch special videos and follow “tweets” online at CatholicTV’s Facebook and Twitter pages. Father Robert Reed, President and Jay Fadden Executive Vice President and General Manager of the CatholicTV Network will lead the staff in producing shows including a series called “Viaggio a Roma” which explores some of the beautiful and holy places in Rome. 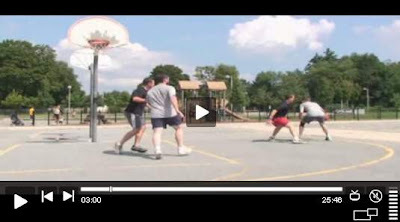 CatholicTV’s Facebook page will post daily videos of some of the various places filmed. The Viaggio a Roma series will include footage and commentary of: St. Peter’s Square, the Vatican Gardens, the Basilica of St. John Lateran, and many more sights and experiences of Rome. CatholicTV plans to produce several new recitations of the rosary while in Rome. These devotions will be recorded at the Basilica of St. Paul Outside the Walls, the Catacombs of Priscilla, and more. CatholicTV will also record a special episode of the show “House + Home”, and its signature talk show “This is the Day” while in Rome. CatholicTV asks that its supporters pray for CatholicTV and its employees especially during this trip to Rome. 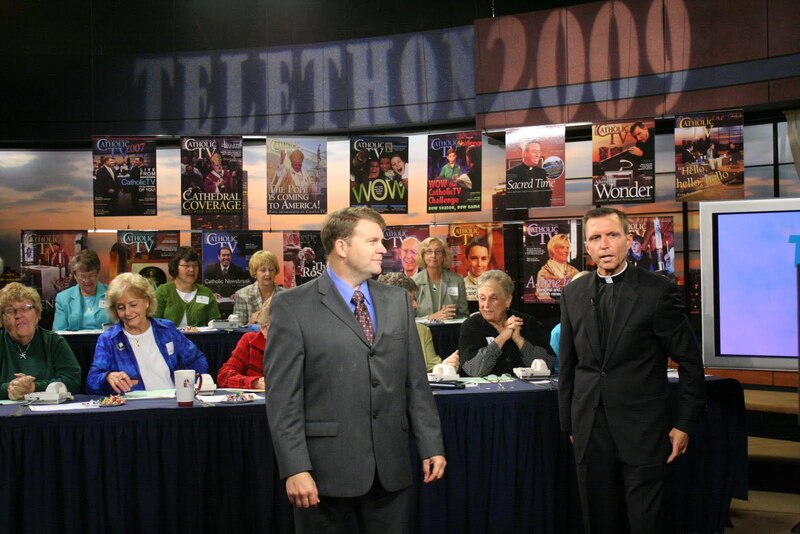 CatholicTV’s 2010 telethon will air on Oct 1st and 2nd and will include some live and music. Musicians from different parts of the country will donate their voices for the annual telethon. The Telethon will also include interviews of CatholicTV’s movie critics, Fathers Chip Hines and Bill Kelly, as well as an interview with Catholic filmmaker and Harvard student Matt Weber. The Telethon will also include performances from previous telethons such as those by John Michael Talbot, Donna Lee, Gretchen Harris, and more. In addition to music and interviews, the Telethon will also include shows from the new season at CatholicTV including the new Catholic art show “The Way of Beauty” and much more. The 2010 telethon will air on CatholicTV from 9AM (Eastern Times) to 10PM on October 1st and will continue on October 2nd from 9AM to 10PM. The 2010 Telethon will be viewable at CatholicTV.com and on CatholicTV cable outlets. Below is additional information about some of the musicians and interviewees who will appear on the 2010 CatholicTV Telethon. Fr. Vern Decoteau- Catholic priest from the Diocese of Springfield, Massachusetts. He once performed for former President George H. Bush and his wife Barbara at their home in Maine. The Sisters of Charity of Our Lady Mother of the Church- Sisters from religious order started in the U.S. in 1970. Not only do the sisters have beautiful voices, they also work with the poor and aged. Fr. Chris Hickey and Fr. Paul Rouse- Both priests of the Archdiocese of Boston and stars of the CatholicTV show “Going My Way” which is a modern version of the old Merv Griffin show and includes singing, piano, and interviews. Paul Melley- Musician who has performed throughout the United States, Canada, and Europe including two World Youth Days. He will perform live. On September 28th, a relatively new website which is meant to encourage priests and vocations will be discussed on the CatholicTV talk show “This is the Day”. After talking to a priest, Tom Peterson, the founder of Catholics Come Home, was reminded that priests typically have heavy workloads, demanding ministries, and sometimes feel lonely. Tom came up with the idea of an online resource that would help lay people encourage and support their priests. EncouragePriests.org does this by offering special emails and notes called “Collar Hollers” which can be mailed or emailed to priests. These notes say thank you to priests and “spiritual bouquet” notes let priests know that the sender is praying for them. Senders of spiritual bouquets can offer masses, Rosaries, Adoration and other prayers and devotions for their priests. Tom Peterson will be interviewed on the live talk show “This is the Day”. This is the Day airs at 10:30AM ET at CatholicTV.com and on CatholicTV cable outlets. The show is rebroadcast at 7:30PM and other times during the week. Tom Peterson has over 25 years of experience as an award-winning and record-setting national corporate advertising executive and entrepreneur. Mr. Peterson speaks at National Catholic Conferences and pro-life events throughout the United States and internationally, and has presented at the Vatican and the United States Conference of Catholic Bishops. He has also been featured in hundreds of media outlets. On September 21st, Colleen Perfect, President of Catholic Parents Online (CPO) will be interviewed on the live CatholicTV talk show “This is the Day”. CPO is concerned with helping parents, teachers, and students find education and resources which are faithful to Catholic teaching. CPO does this by helping Catholics with networking, online educating, and other means. Fr. Thomas Schmitt will also be interviewed on This is the Day. Fr. Schmitt is the Dean of Seminarians at Blessed John XXIII National Seminary. Blessed John is a seminary for candidates between 30 and 60 years of age. Located in Weston, Massachusetts Blessed John is the only American seminary for older candidates administered by diocesan priests. For more than four decades, candidates have been accepted from various professional backgrounds; such as law, medicine, business, teaching, sales, banking, social work and military service. The original seminary for Americans in Rome is located on the Via dell’Umilta: “The way of humility,” “Humility Road,” if you will. There is a great lesson here because the way of humility…well, we can choose it or it will eventually be impressed upon us in this life…and most certainly in the life to come. Things like the fear of terrorist attacks and a tremendous crisis in our Faith community have humbled us as a Church and a nation. We are great and powerful, but maybe not as commanding and impressive as we might have thought. No, we are vulnerable, and hardly the perfect society. 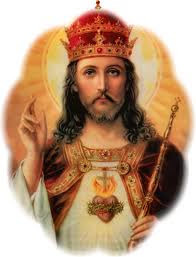 Perfection and true greatness will only be found in God’s Kingdom which is, as the Italians say: “Gia ma non ancora,” “Already, but not yet.” That is why we pray together so often: May Your Kingdom Come; Lord! One of the great lessons of living the Christian life is a learned sense of humility. Remember, first of all, that God chose to humble Himself in coming among us as a human person, as a man. So, if to be an authentic Christian means to be like Jesus Christ, then humility has be the foundation and the hallmark of our lives. I hold that the greatest joy and personal benefit of the priesthood is what we, as priests, learn from the people whom we serve. In fact, in many ways, a priest gains more from others than he gives. To recognize that another’s spirits are not as high as usual and to just say hello or ask, “Hey, how’s it going?” To make the effort to go to a wake to express your condolences to a family; to tithe to one’s parish or one’s favorite charity; to accept criticism, realizing that within that critical comment, there is probably some truth that will make you a better person. These are just a few simple examples of what humility in daily life really can be. And these opportunities have the power to transform us into authentic witnesses of Jesus Christ. Jesus died for us: the Word of God made flesh; the Word Who was present at the creation of the world. Not only has Jesus put aside His glory to become Man and to live in our midst, but He put up with all of the disappointments and the aches and pains and the occasional drudgery of human living …and then He laid down His life for His friends. No greater, no more deferential love could there ever possibly be. So, my friends...conduct all of your affairs with great humility. Humble yourself the more and the greater you will be. And remember, people are watching us, they are observing us carefully…to see if our actions match the Faith we are about to profess! “Everyone who exalts himself will be humbled. But the one humbles himself will be exalted.” That's the Lord’s promise to us. Model your life on the mystery, the humility of the Lord’s cross. On September 24th, Dede Laugesen, will be interviewed on the live CatholicTV talk show “This is the Day”. Dede and her husband Wayne are the creators of the Holy Baby! DVD series, which are Baby Einstein-style videos for babies and children except that they feature Catholic prayers. On This is the Day, Dede will discuss rosaries which are meant for military, law enforcement, firefighters, healthcare workers and priests/religious which she and her husband sell online at therosaryproject.com. 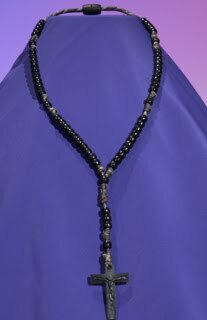 The Rosaries are constructed using military-issue parachute chord, and are highly durable. The website says, "Run over it with a tank. It probably won't break...it being the tank." The Holy Baby! series broadcasts on CatholicTV as part of the CatholicTV Kids Club programming block. Holy Baby! Won the 2005 Videographer Award of Distinction and a 2005 Telly Award. From September 16th-19th, CatholicTV will air the Pope’s 4-day Papal visit to the United Kingdom. The Pope’s visit will include meetings with young people in Scotland and England, meetings with the Queen and the Anglican Archbishop, a parade in Scotland, the beatification Mass for John Henry Cardinal Newman. Coverage of these events will air September 16th-19th at noon and rebroadcast at 8PM (Eastern) each day. This coverage will be viewable at CatholicTV.com and on CatholicTV cable outlets. Sept. 19th- Beatification Mass of Cardinal John Henry Newman with Pope Benedict at Cofton Park, Birmingham. Deacon John Sullivan of St. Thecla Parish in the Archdiocese of Boston has been invited to assist and proclaim the Gospel at the Mass of beatification for Cardinal Newman. Deacon Sullivan experienced the miracle healing of his spinal condition, which led to the advancement of the cause of beatification of Cardinal Newman. Archived Papal Programming can be accessed any time at www.CatholicTV.com/Pope-Benedict-xvi (including Feast of the Assumption Mass, Pallium Mass, Papal Visit to Cyprus, and more). On September 17, the Ignatian Volunteer Corps (IVC) will be discussed on the CatholicTV talk show “This is the Day”. IVC is a unique volunteer organization which matches up volunteers aged 50 and older with non-profit organizations which serve the materially poor. Perhaps the most unique aspect of IVC is its spiritual support program which involves keeping a journal, one-on-one meetings to discuss spiritual reflection and meaning of the volunteer work, and monthly meetings with a community of volunteers. Virginia Parker and Lara Herosy will both appear on This is the Day. Virginia is a volunteer with IVC and Lara is the Director of Catholic Charities’ English Transcultural Center (Boston), which partners with IVC. 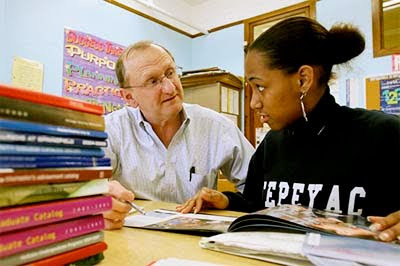 At the English Transcultural Center, volunteers help teach English to new immigrants.